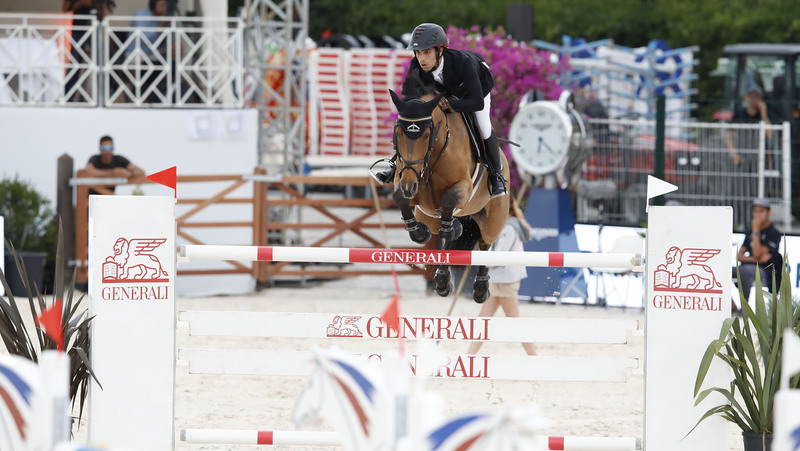 The first class of the Longines Global Champions Tour of Cannes was the perfect premier to a weekend of top sport, as the world’s best take centre stage on the French Riviera for the seventh leg of the Championship. Abdel Saïd (EGY) kicked off his weekend in style, with a brilliant win with top mare Hope van Scherpen Donder, who returns to CSI5* competition on phenomenal form. With less than a second separating the top three riders, second went to Julien Epaillard (FRA) with Usual Suspect d’Auge and third to Bassem Hassan Mohammed (QAT) with Argelith Squid. Uliano Vezzani set an interesting course, a 1.45m track which allowed horses and riders the chance to take on the fences flowing on oblique angles. The first of the related distances was a nice regulated four strides to a plank, easing the world’s best into the weekend’s competition, but the treble combination featured a big oxer which required all the scope and power from the horses. The second phase saw riders ramp it up a gear, with a Swedish oxer catching out some of the best, and the final fence agonisingly tumbling a fair few times. Local fans in the grandstands were delighted as home hero Simon Delestre (FRA) and Hermes Ryan put in a brilliant clear to take an early lead, before they were quickly surpassed by compatriot Julien Epaillard (FRA) with his LGCT Grand Prix of Paris winning horse Usual Suspect d’Auge - the pair flying round in 24.90s. The speedy Frenchman’s time looked unbeatable, until Abdel Saïd (EGY) powered around the small sand arena with Hope van Scherpen Donder, shaving off milliseconds on the roll back to the green and white oxer. Others used the class to give their horses their first taste of competition under evening lights, with Scott Brash (GBR) and Hello Mr President, Harrie Smolders (NED) and Emerald, and Jos Verlooy (BEL) with Igor all putting in steady rounds, but looking on strong form. Many were keen to put their stamp on the start of the weekend, with Bassem Hassan Mohammed (QAT) and Argelith Squid, Niels Bruynseels (BEL) with Lady Cracotte, Eric van der Vleuten (NED) with Wunschkind 19, Nayel Nassar (EGY) with Lutz and Danielle Goldstein (ISR) with Celebrity VDL just a few of the names putting in quick times. But none could match Saïd’s time, with the Egyptian rider taking the first win of the weekend. The next class, the GCL Cannes, will kick off at 20:30 local time, with all the action streamed live on GC TV.